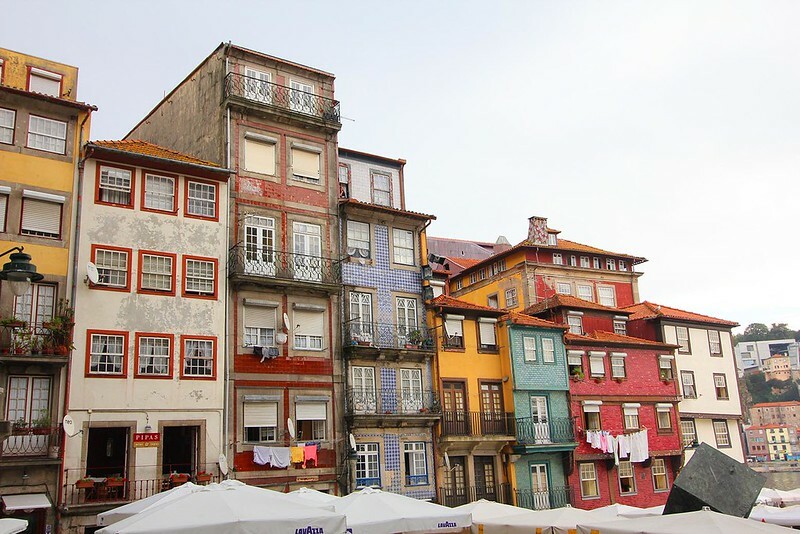 There is more to Porto than just port. It is a charming city of cobblestoned streets, terracotta roofs, intriguingly tiled buildings and magnificent churches. Not to mention more shoe shops than I’ve seen anywhere previously. If we hadn’t had a pitiful baggage allowance (thanks to Ryanair: the world’s most hated airline) I’d have easily spent half a day perusing their gorgeous selections. As it was I hobbled about in my new Adidas sneakers and layers of elastoplast around my blistered ankles. We consulted our oracle, Trip Advisor, for somewhere nearby that was decent – we’d booked into an Ibis hotel on the northern edge of the centre of town and, it turned out, a few steps from a truly wonderful and authentic local eatery. Ok, so it didn’t look like much, but this place was one of those establishments with an extremely small menu but they do what they do very well, and what they do is roast pork. On the counter as you walk in is a huge piece of meat and they carve off succulent slices then serve them in a slightly spicy gravy in fresh, crunchy bread rolls. They were perfect. We washed down our roast pork with a bottle of the local vino verde (green wine) the first night then stopped by for lunch the next day. On our second day Luke made a list of landmarks to visit and we made our way around the city . 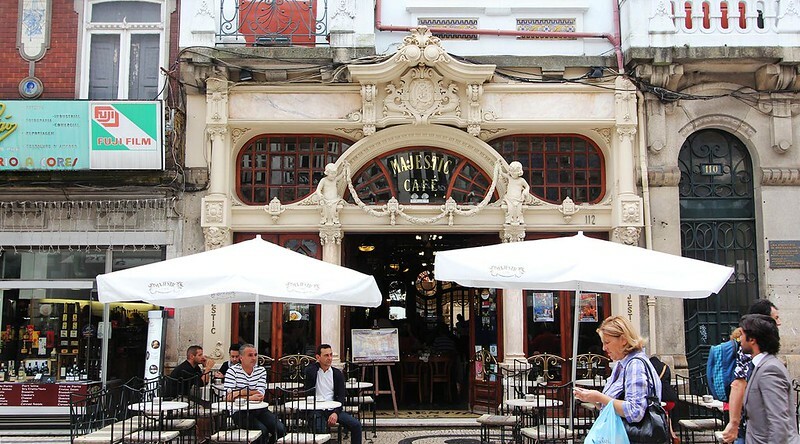 First stop was a large building that housed a varied market where I bought a couple of tea towels (I’ve lost count of how many I’ve bought now) but there weren’t many stalls open so we moved on to our next stop, Porto’s most famous cafe, the Majestic. 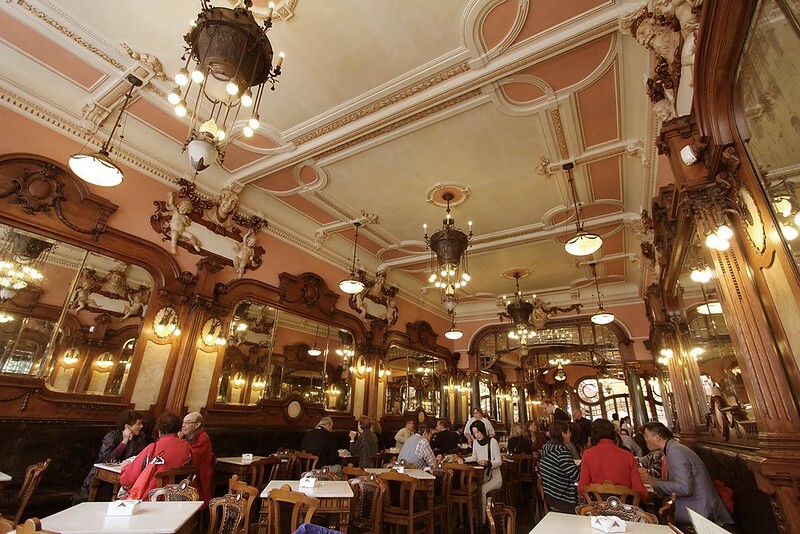 A beautiful example of Art Nouveau architecture. We enjoyed a breakfast of hot scones, jam and cream in the cafe’s gorgeous interior. My friends in Melbourne who enjoy dressing up for high tea would feel right at home here. All original fittings from the 20’s. 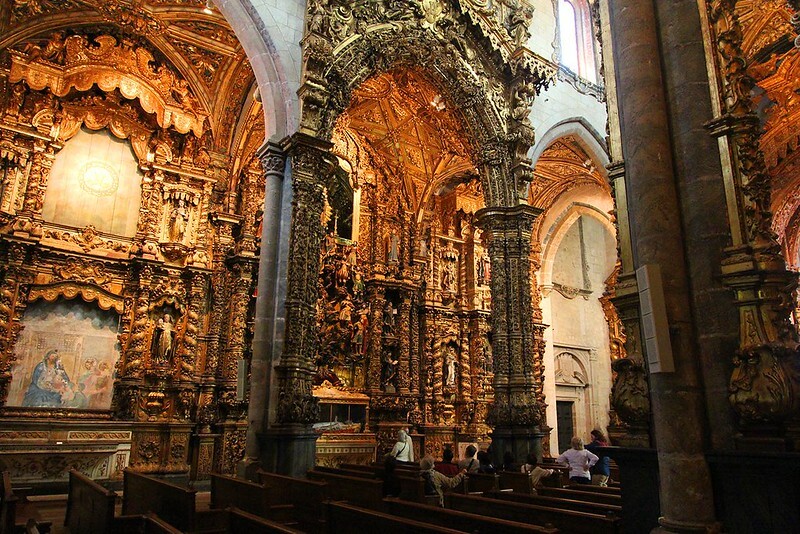 Next we headed to a church – something I wouldn’t normally go out of my way for, especially not after the dozens we’ve already seen in Europe, but this one was special – the interior was almost entirely covered in gold. Another place where we weren’t supposed to take photos. I assume because we’ll use our photos to build an exact model somewhere else and lure tourists away from their attraction. Obviously. Next we headed down to the waterfront. The alleyways of Porto remind me of Edinburgh. Dark stone, narrow and many, many steps. But when you get down the the waterfront the colours of the buildings and the tiled walls shine in the reflected light from the river. 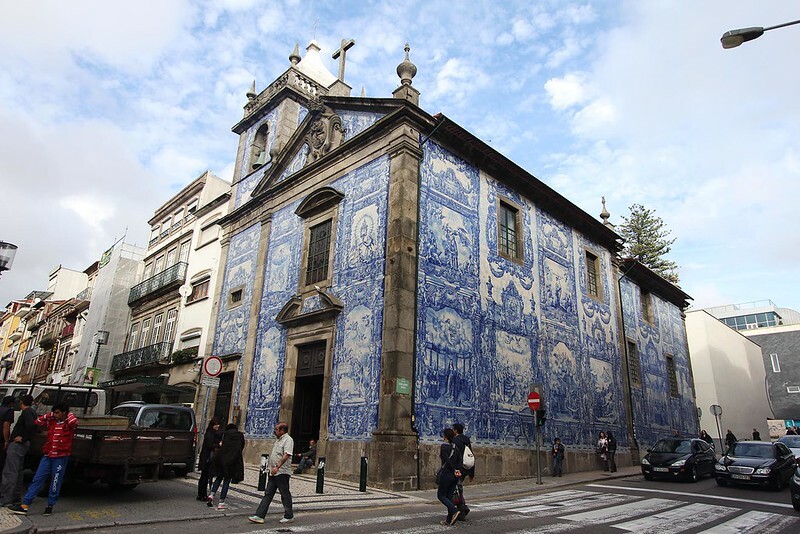 Many of the churches are covered in very detailed scenes painted on tiles. I almost forgot – we also visited Livraria Lello, a bookstore with the most elaborate staircase you can imagine seeing in a shop. Apparently JK Rowling lived in Porto for a time and lived near this shop. It’s credited with inspiring scenes in Harry Potter. Another place where photos aren’t allowed so I borrowed these from another website. 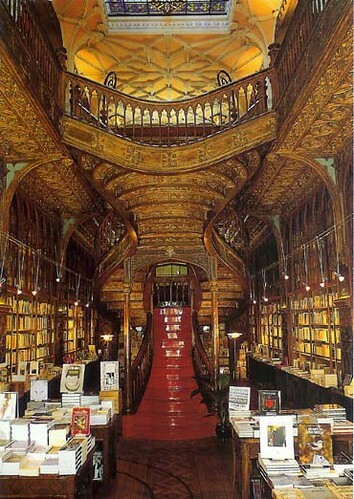 Considered by many to be one of the world’s most beautiful bookshops. I think we could’ve easily spent a few more days exploring this city but England was calling us and we had a plane to catch. Next stop: Cambridge! Wow! The Majestic looks like Confeteiria Colombo in Rio de Janeiro (not by coincidence I’m sure). Gosh, just googled the place you mentioned – ever bigger and more grand! 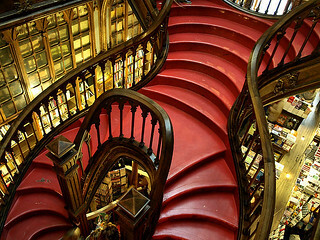 It was a pretty impressive bookshop – shame the staircase wasn’t carpeted, but it’d probably wear out pretty quickly. I know what you mean… mostly travel makes me appreciate home more, but there isn’t much architecture in Australia that compares with the vibe of old European cities.